Knowing how scary it is to utter obsessions and compulsions, I honestly thought Dr. Baer would have to call on me to sit at the front of the room with him. Instead, several audience members volunteered, eager to learn from his expertise. Melanie Lefebvre, our guest this week, ended up sharing her struggle with hit-and-run OCD with Dr. Baer and, of course, the whole group. Melanie was so terrified she might hit someone while driving, and possibly kill the person without even realizing it, that she’d stopped driving altogether—even though her job occasionally required her to travel throughout the day. She’d resorted to taking the bus and having her husband give her rides. She thought she’d never drive again. You were so brave to volunteer! Tell us why you did. I almost didn’t! I joined the people who were gathered around Dr. Baer during the break to soak up as much knowledge as I could. I had connected with Dr. Baer prior to the workshop to verify whether it would be a good fit for me. When he saw me at break, he asked if I’d like to volunteer and I shyly declined. Dr. Baer surveyed the group to see who had done treatment—everyone had. I shared that I had dabbled in it and suddenly I had a cheer squad rooting for me to volunteer. How could I resist a cheer squad? You mentioned you dabbled in therapy before the conference. How was that working for you? I would do the reading; I’d make the hierarchies; I’d do the cognitive work. But the thought of driving around my neighborhood for 20 minutes as an exposure was terrifying. I kept chickening out once it got to the gold standard of what works. It was pretty cool to watch Dr. Baer talk you through your fears and help you come up with a plan to confront them. It was like inspirational OCD improv. How did you feel as he gave you advice? Hearing you describe it as inspirational OCD improv is a confidence booster! I was worried I was boring everyone—that someone else should have volunteered. Good ole OCD doing its thing. Despite that, I was incredibly grateful that I was getting personalized advice. It was a surreal experience that left me floating on air. Did you feel empowered to implement his advice right away, or did you still have your doubts about whether you’d be driving by the end of the summer? I definitely had doubts but I had committed to Dr. Baer, to a room full of people. My OCD trumped any feelings of empowerment but accountability was something I could embrace. Accountability was the motivator that gave me the push I needed. Thank you, Dr. Baer and the room full of people! You’re doing well now, and you’re driving again. I think that’s such a powerful testament to how well ERP works. Were there moments or days when you struggled through the ERP, and if so, how did you work through it? It was hard listening to the Stephen King–inspired loop tape over and over. [Editor’s note: Dr. Baer challenged Melanie to think of her worst “Stephen King scenario” related to her hit-and-run obsession and record herself describing it.] But I’d been given a prescription and I was going to keep taking the course of antibiotics. Eventually, I became bored with the script and knew it was time to get behind the wheel. I got through it by remembering what a psychologist from Texas told me after the workshop: “Just drive an inch.” Anytime the fear of getting behind the wheel surfaced, I reminded myself all I needed to do was drive an inch. But once you drive an inch, the inches keep building. It also helped to have my husband as the passenger until eventually I felt brave enough to drive solo. I’d poke fun of the OCD and sing “All I do is kill kill kill no matter what!” to the tune of “All I Do Is Win.” Or my husband and I would see pedestrians and say, “Another opportunity for a kill!” It sounds awful but OCD is what’s awful. Taking it to an absurd level helps take its power away. On the days where those strategies didn’t work, I’d get home and sit with the anxiety until it went away—repeating over and over that I had killed someone—an impromptu loop tape. It’s still hard. I still avoid driving at times. But I haven’t stopped driving altogether like I had before the conference. Not only are you doing better, you’ve also started sharing your story on the OCD and Families blog. Has writing about your experience with OCD helped you get through it? Writing about my OCD allows me take something nasty and mold it into something else. Being featured on the OCD and Families blog has been empowering (finally empowerment is trumping OCD!) and helped me embrace my inner advocate. Tell us more about your OCD awareness videos on YouTube. Where did you get the idea to model it after a cooking show? It’s so clever! The OCD Awareness Video Contest through the IOCDF threw me for a loop initially. I wasn’t a videographer. I’m a writer! Where was the writing contest?! But I knew that if I was going to make a video, I wanted it to be creative, to intrigue the audience. So my husband and I got to brainstorming. The plan wasn’t for me to be the chef. We were going to focus on the mixing bowl and feature text explaining the ingredients of OCD. I wanted to explain less commonly known types of OCD—give them a deserved place in social media. 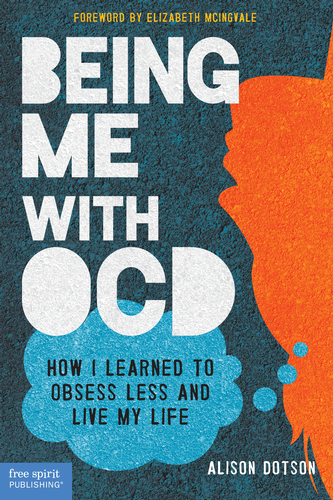 And by disclosing about having OCD, I hoped to combat stigma—not only from the public but to also challenge the self-stigma that was still lurking within me. This naturally progressed to the idea of a cooking show—why not be the chef? When else do you get to wear a chef’s hat? If you could give just one piece of advice to someone with OCD, what would it be? But I can’t stop at one! Tip two: connect with others who have OCD at your own pace, whether it’s an anonymous online group or a support group in your hometown. Peer support is special and dear to my heart. 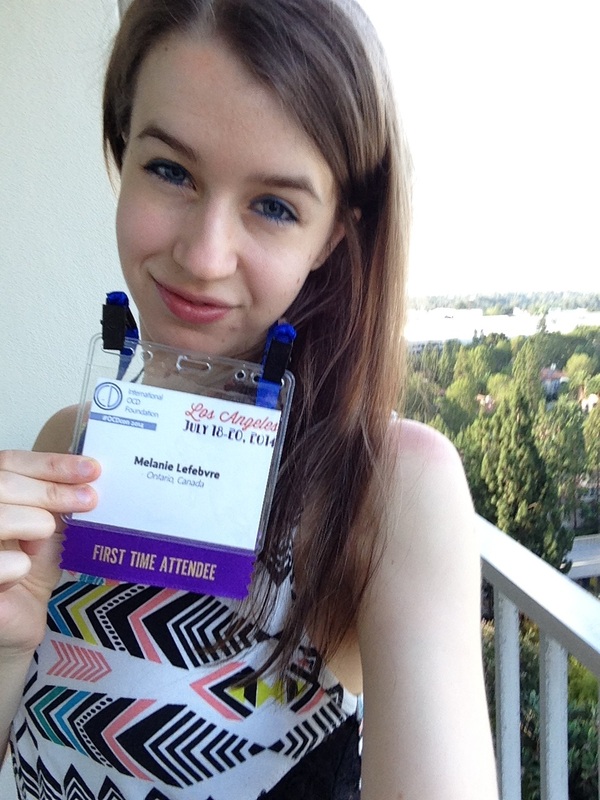 I loved the conference and being surrounded by people who understood OCD—so much so that I felt pretty let down once I was back in the real world! Tell us about your experience at the conference last summer. Was it the first time you’d attended? Other than meeting with Dr. Baer, what was your most memorable experience? I can relate to the sharp contrast of the real world to the world of the International OCD Foundation’s annual conference. 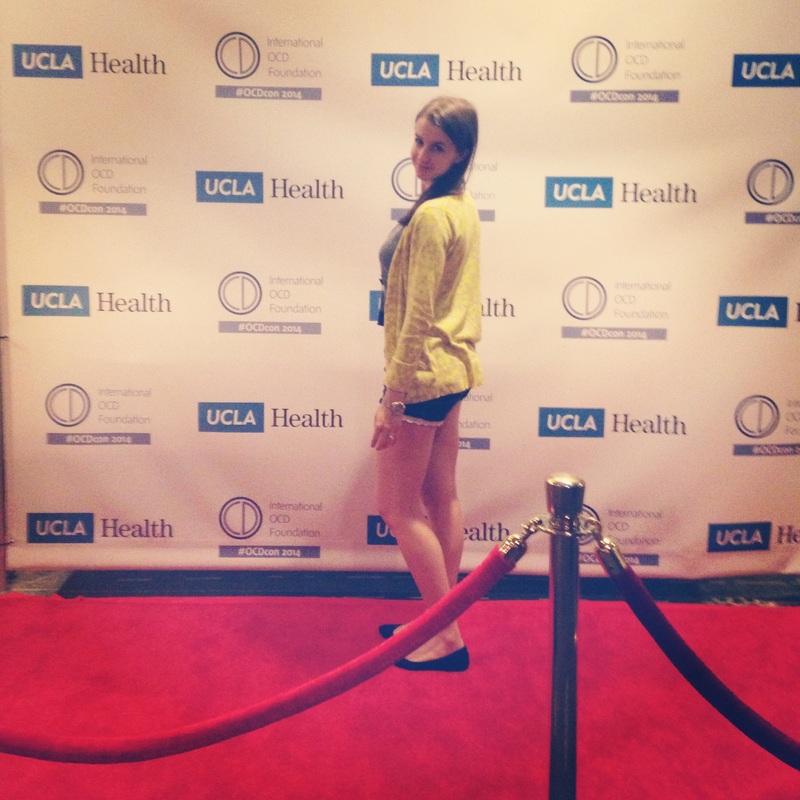 Attending the conference for the first time was the biggest accomplishment of my life. It was a huge ERP on multiple levels. My second most memorable experience is Ethan Smith’s speech which was heartwarming and hilarious all wrapped together. But I’ve got to add another: meeting my friend from an online support group. Meeting in person solidified our friendship. We were partners in crime as we experienced our first conference side by side. Do you plan to attend this year? I am grateful to have won the OCD Awareness Video contest through the IOCDF that comes with a prize of a trip to the conference. The win gives me a push to keep challenging myself. I still have travel-related OCD but the conference is calling!